It is a well known fact that Sonam Kapoor takes her fashion seriously . I love Sonam kapoors outfit experiments and her jewellery picks but there another thing which sonam excels in and that is adding variations to her hairstyles. Sonam kapoor never keeps her hair boring and she makes an effort to keeps changing up things and sports open hair, curls, retro updos and buns with equal elan. Indian weddings involve brides having to put dupatta over their heads leaving not much room to experiment with hairstyles , you have to settle for a bun or an updo and the beauty of it cant be seen unless your dupatta is see htrough one. Even south indian brides who dont viel their heads stick to braided traditional hairdos. Engagements are the time when brides can experiment with different hairstyles freely, you may be wearing a gown, lehenga, saree or even an anarkali and these Sonam inspired hairstyles should go well with all of them , so sit back and scroll down before youfinalise on your engagement hair look. Note: you can try these style even on your other wedding functions like cocktail, sangeet, mehendi or your wedding reception. Hair curled and twisted on the sides from middle parting gives a very fresh and young feel. Go for this if you wnat to leave hair open . Another style to try if you want to keep your hair open. Curl your hair sweeping it from the side and don't forget to set it with a hair spray to keep flyaway at bay. A neat middle parted bun with hair on both sides twisted goes best with a traditional silk saree. add some gajra in hair for extra effect. this style also looks good if you are wearing a traditional kerala white and gold saree. 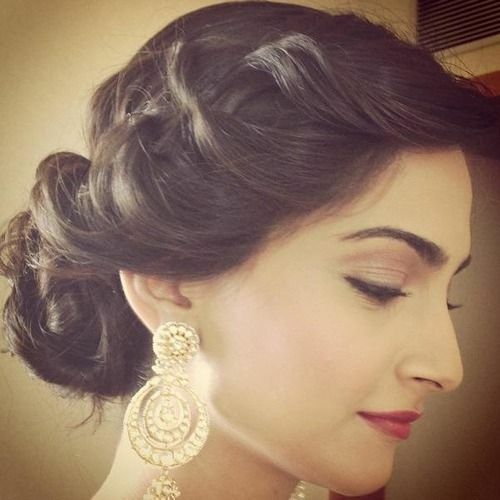 Buns can look very mature but sonam shows how to do it the young way. A wispy side bun with hair twisted on one side and some loose wavy bangs on the other side. The middle parted hair means you can add a tikka without messing things up. Perfect. This is my favourite. That sun kissed hair colour, love it . if you want to experiment with hair colours for your engagement , inspiration is right here! Colour and style it like sonam with extra volume. This Hairstyle is super easy and i have tried it myself . Looks very glam and easy to do , so if you are having an intimate roka try this style on your own at home. You can add some floral clips or real flowers to up the glam quotient. Large curls on the sides has then been knotted in a very loose low bun . This style looks very classy and elegant still has that messy vibe to it. I just love how fresh this style is , just twist hair from side , pin it and pull your hair to the other side and band it . Cute and young. If you want to let your outfit and jewellery grab all the attention go for simple sleek middle parted hair. Which hairstyle do you think is the best one?